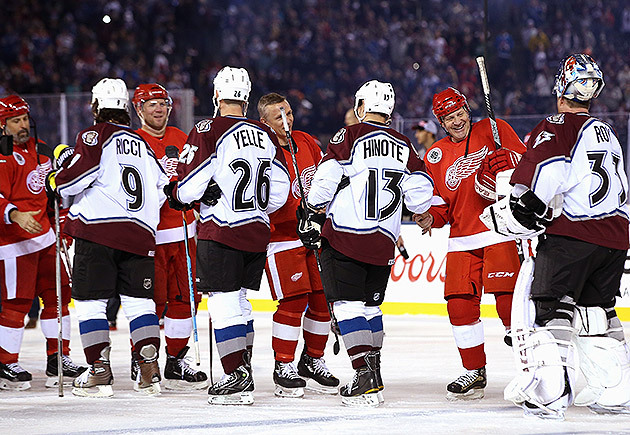 The past and present collided for the Red Wings and Avalanche this weekend thanks to the NHL Stadium Series. DENVER — If you type “Red Wings Avalanche rivalry” into Google, the first search return you’ll come upon is a Wikipedia entry entitled “Red Wings v Avalanche brawl.” You’ll find multiple YouTube videos of the now infamous 1997 melee, you’ll even find retrospective articles written about it just in the last two years. The NHL Network even has a montage of the rivalry’s top 10 moments. This weekend, current and former members of the Detroit Wings and Colorado Avalanche met at Coors Field in the final NHL outdoor game of the season. When the teams were members of the Western Conference, as recently as the 2011–12 season, their rivalry was one of the fiercest and most revered across hockey. Fans dropped what they were doing to tune in and see what would happen next. The rivalry between Detroit and Colorado got very heated, very fast. It began in the 1996 Western Conference finals, in Game 6 when Avs forward Claude Lemieux cross-checked Kris Draper from behind and into the boards, face-first, sending the Wings winger to the hospital a bloody mess. The hard feelings carried over to the following season, reaching an apex on March 26 as Detroit dispatched the Avalanche with a 6-5 overtime victory that became knows as ’Bloody Wednesday’ at Joe Louis Arena, featuring 144 penalty minutes and a line brawl that saw goalie Patrick Roy trade punches with hardened Red Wings counterpart Mike Vernon, with tempers understandably high. NHL roundtable: Should trade deadline be changed? Two decades later, there are still some lingering emotions for Ciccarelli and a number of his fellow ex-Wings. “Everything that went on for all those years, all the fights and everything, it’s tough to put it behind you and not think about it,” he said. It’s not hard to argue that the often-agitating Avalanche forward was the catalyst for how quickly some mild dislike turned into hatred. As heated as the rivalry grew, so did the mutual admiration. “I think it’s right up there with some of the battles I had early on in my career with the Leafs or the Hawks. This is probably a step above that because of how good both teams were,” said Nicklas Lidstrom​, a four-time Cup winner in his 20 seasons of wearing Detroit’s winged wheel logo. For Roy, the inimitable Avalanche head coach and fiery Hall of Fame goalie, strapping on the old Kohos for the rematch was a no-brainer. While the prospect of an outdoor matchup between the current-day Avalanche and Red Wings was enough to bring over 50,000 fans to the home of baseball’s Rockies for a good old hockey game, plenty of spectators had an eye on Friday’s alumni game. Even Jarome Iginla, one of the NHL’s elder statesmen as a 38-year-old winger on the Avalanche roster, felt the intensity of the rivalry at its peak while skating with the Calgary Flames. For Red Wings rookie wunderkind Dylan Larkin, born in Michigan on July 30, 1996, two months after the Avalanche eliminated the Red Wings and eventually won the Stanley Cup, the Internet played a big role in learning about the blood-boiling spirit. And thankfully for those who took to the ice for the alumni tilt, the heat had dissipated, but the nostalgia remained for the teams stocked with 12 Hall of Famers, five Conn Smyth winners, 39 Cup champions and heaps upon heaps of talent. There was a distinct regular-season NHL game feel for many of them, having not hung up their skates all that long ago. “We’re just happy to put the past in the past and turn the page and let the young guys battle it out,” Lemieux said, sitting in his stall after the Avalanche alumni handed their rivals a 5–2 loss. With the yesterday’s stars surrendering the ice following their hurrah, Saturday gave way to the current generation, and it carries with it some heat of its own. The boos were hearty as the Red Wings took the ice, the play was physical—though there was only a little blood spilled when defenseman Kyle Quincey took a high stick from Avalanche forward Cody McCleod in the first—and fast. Even Detroit forward Pavel Datsyuk, known more for his silky mitts than for dropping them, was called for a roughing penalty. “Pavel can throw things around too,” Red Wings captain Henrik Zetterberg said of the foul. • MUIR: Which teams could get their first outdoor NHL game next? The rough stuff aside, the teams combined to give the 50,095 in attendance what they wanted to see: Detroit forward Gustav Nyquist knotted the score in the third period with a sublime no-look backhander that beat goalie Semyon Varlamov up high and minutes later, Justin Abdelkader put the Wings in front. Alex Tanguay followed up for the Avs in just 14 seconds, though Brad Richards made it all for naught with a last-minute tally that put Detroit up for good en route to a 5–3 win. For Richards, who was skating in the Saskatchewan Junior Hockey League when Lemieux’s Hit Heard ‘Round the Hockey World happened, it was a chance to be a part of the history he watched in his youth. One thing all of the weekend’s players said was that they were out to have fun—and, of course, to win. While only one team skated out with two points in the standings, there came a deeper appreciation for one of sports’s greatest rivalries. It might not be what it once was, but it’s definitely still there.